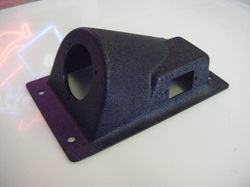 The customer hand-formed the rough shape of the product he wanted, and we took it from there. We worked around the components that had to fit in the production part. 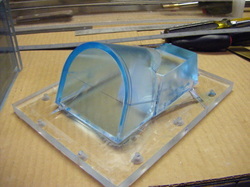 A design mold was fabricated from acrylic in-house. 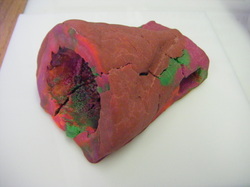 The female mold was created from the acrylic mold, then the final male forming mold was cast from this. 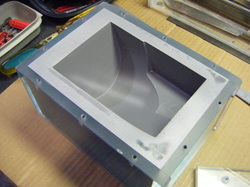 The final part, thermoformed from black ABS, trimmed, with secondary cutouts, mounting holes and reinforcements.